A tomato salsa recipe that's easy and hot! There's no doubt that salsas can make a wonderful addition to a meal - especially if the salsa is freshly made from the best organic ingredients available. So here's an easy fresh tomato salsa recipe. It's as hot as you like and is vegetarian. It's really simple to make and it will give a zing to an otherwise unexciting meal! Salsa is simply Spanish and Italian for sauce. Salsas tend to be cold sauces based on vegetables and herbs, though there are some hot ones, too. 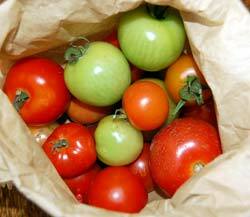 The tomato salsa recipe below is based on fresh raw foods. Salsas have enjoyed a huge popularity in recent years and you can now pick up a jar of some kind of salsa in supermarkets almost anywhere. That said, they can come in an astounding range of varieties but the best ones are certainly homemade and fresh. Salsas are used extensively in Mexican cuisine and because they feature chilli (chili) peppers, they are generally hot! Here is a good tomato salsa recipe. It is based upon the classic salsa dish pico de gallo (rooster's beak) which is made with chilli. It's important to know that this salsa recipe is not suitable for storing.You can pop it into the fridge overnight but after that any unused salsa should be put in the compost bin. The proportions are up to you. As a general guide, about 4 medium tomatoes, 1 medium onion, 3 or 4 small gherkins, a dessertspoonful of capers, a dessertspoonful of wine vinegar (or slightly more of cider vinegar as it tends to be weaker), 3 or 4 good dessertspoonfuls of olive oil, one or two garlic cloves, a small handful of parsley, mint or other herbs. Add in finely-chopped hot chillies to taste. As chilli peppers vary widely in their potency, I have not specified an actual amount. I tend to use one small, medium strength chilli - but I'm not a fan of being knocked for six! Chop the tomatoes really finely with a sharp knife. Likewise the onions or shallots. Chop or slice the gherkins and add the capers, drained of excess liquid. Chop the garlic finely. Mix everything together with the oil and vinegar. Add the chopped up herbs. Taste to ensure that you are not letting any one flavour overwhelm the dish. Serve with almost any meat or egg dish. it also goes well with fish, pasta, cheese... you name it! You can vary the herbs - fresh coriander leaves, basil and tarragon are particularly good. It is easy to add in fresh chilli peppers if you like a bit of extra zing. You can also add strips of dry cured ham or chopped anchovies*. Fish sauce and Tamari soy sauce are both valuable additions if used sparingly. * Anchovies are one of the fish stocks which are coming under increasing pressure - try to obtain sustainably harvested anchovies if possible. See The Benefits of Fish for more information. If you want a good book on salsas and other dips Chips, Dips, & Salsas is one of the very best. It's easy to read and the recipes are absolutely mouth-watering.